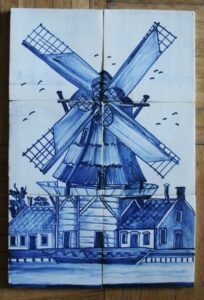 AAN HUIS GEBAKKEN is a tile workshop where wall- and floortiles are made by hand following traditional methods. Clay must be moulded in a ball and then rolled flat between two litle slats. The higher the slats, the thicker the tile. 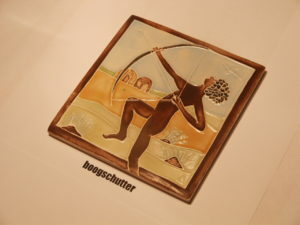 Now the tile can be cut out of the clay plate using a wooden mould. The tiles must be dried between plasterboards. In this way the clay slowly dries and the tiles stay flat. After drying (2-3 weeks) the tiles are fired in a kiln at 960 ºC. The firing takes about 30 houres. To glaze the tiles they are bathed in a glazebath. They have to be fired again at 1025 ºC. This time the tiles are not allowed to touch eachother, so they are fired within cassettes. 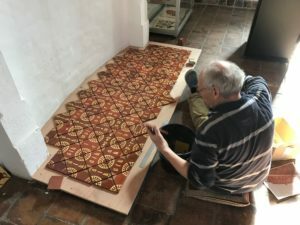 Decoration on tiles has to be done after bathing in the glazebath. For painting on the unfired glaze I use glaze coloured by metaloxides. This technique is called Majolica. Because tiles are made and painted by hand there always will be differences between tiles. This gives my tilewalls such a vivacious aura. An other product of the tile workshop are two coloured inlaid floortiles. The measure is 9,6 x 9,6 cm or 12,5 x 12,5 cm. Thickness 10 mm. The used patterns are chosen from medieval examples as they survived in English and Franch churches, priories and castles or otherwise.